Pregnancy Etiquette & 13 Week Photo | are you my moms? When did it become ok for male acquaintances to ask very specific questions of pregnant women like “do you have any cravings or food aversions?” or “why aren’t you showing yet” I’m not sure it will ever be ok, at least not with me. Now that most people have grown accustomed to the idea of their pregnant lesbian friend, they’ve stopped asking questions about the donor or using the phrase “turkey baster.” Unfortunately this means we’ve moved on to another phase: invasive and awkward questions about the pregnancy itself. Note that I don’t mind one bit when our friends ask questions, and am likely guilty of over-sharing with all of them. I also don’t really mind when women who have had babies ask questions. It’s always comforting to share symptoms with those who have experienced them before. Wow – your thighs look so thin! Has your skin always been so lovely and acne-free? No, you’re not moody at all. You’re an absolute delight and I think you’re right…about everything. Let’s all have a 3rd cookie!! A male acquaintance of mine actually told me earlier today that I “need to get [my] waddle on!” It is important to state that while he was telling me this and asking why there’s still no visible bump, this normally intelligent human being started stroking his imaginary baby belly and waddling back and forth like an idiot. It is also important to note that I still have 6 more months to go, so there is certainly plenty of time for waddling. I can assure you all that I will be big as a house by summer. Moments after this bizarre encounter, I left to meet MKL for our 13-week appointment, where we also did our 1st trimester screening. 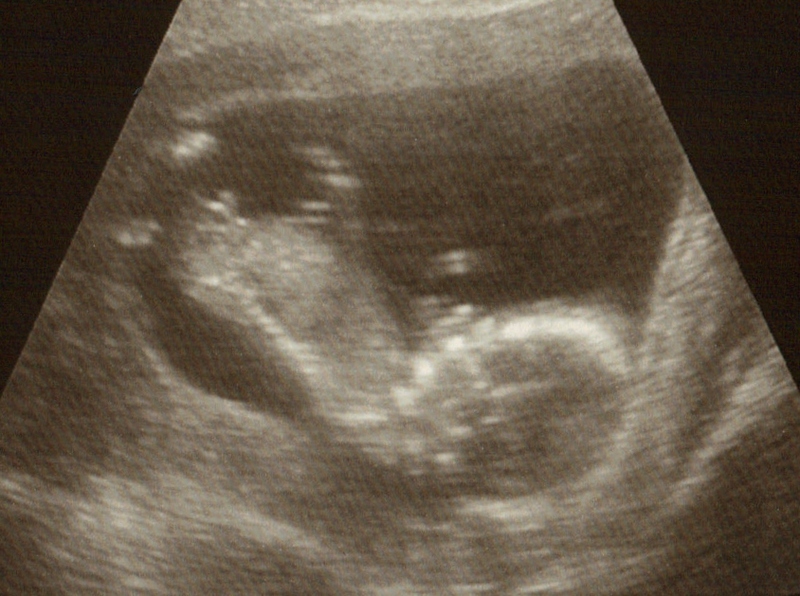 The 1st trimester sreening involved a lengthy ultrasound and blood work, followed by a regular visit with our doctor. The results of the blood work won’t be in for a week, but everything on the ultrasound checked out fine. No, it was better than fine. It was amazing. Back in December when Doc confirmed our pregnancy, I cried when we saw the heartbeat. But that was nothing compared with hearing it. Not only did we hear the heartbeat, we got views from all angles, saw all kinds of organs and once again watched while our little monkey squirmed around and did its very special dance just for us (and Sheila the ultrasound tech). Of course the experience was not without a little humor. Apparently the monkey is just as stubborn as its moms. With all its fancy dance moves, it still took Sheila 15 minutes and some impressive twisting of the ultrasound scan to get our sweet thing turned for a proper profile shot. But it finally posed for the following beauty shot, and we’re absolutely in love. I have to defend the non-moms and non-pregnant ladies. I am always so curious about what it is all like. However, (that is a big HOWEVER), I would never ask a stranger for any details. Just friends. So if it is someone you know, I would just chok it up to curiosity. I would say maybe you should prepare for random strangers to come up and touch your tummy. My friends said it happened more than once. Yikes! Thanks, Mrs. McGee! I am totally fine with most people asking all kinds of questions, particularly most women. For some reason I have an issue with male acquaintences doing the same, though. The examples I used were men with whom I’m just barely acquainted (they’re co-workers that I know well enough to exchange courteous “hellos” in the hallway), and both of them have children of their own. But my friends, male and female alike – including those I only know online through this blog – are absolutely welcome to ask anything! I’m not so sure how I’ll handle the belly touching. I’m sure it’s going to happen, though. Don’t forget seeing a pregnant woman is like watching one of the alien movies for most men. They are bound to ask question based on curiosity. Welcome to the second trimester, hope it breezes by. Thanks! Yeah, I guess it isn’t really the questions that bother me so much as the manner in which they are asked. When a grown man decides to parade in front of my office stroking his imaginary belly and making me feel like less of a pregnant woman because he can’t see my bump, I just don’t find it appropriate.